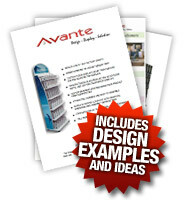 Avant POP Displays specializes in custom, award winning POP Advertising Displays and POS displays. Our eye catching displays will assist you with better retail placement. Avante recognizes each customer’s unique needs and expectations. Why choose an Avante custom POP advertising displays? 1. Based on product dimensions & quantities you require a display to accommodate, email or fax a rough sketch of your display ideas. We will assist and guide you on dealer limitations that may arise. 2. Our design group will contact you to offer suggestions and pricing on the construction of your custom design. Once a preliminary design is in place we will provide you with a 3-D rendering. 3. Your display ideas are quickly turned into reality. We manufacture a prototype of the design within 2-3 weeks. This will give you the opportunity to review the actual unit and our workmanship first hand. View examples of our Point of Purchase Displays.